In response to the BC Government’s plans to build and implement a province-wide poverty reduction plan, CMHA BC Division has submitted a document outlining its recommendations it would like to see incorporated into this strategy. These 25 recommendations, have the potential to support British Columbians’ economic security, and by extension their mental health, well-being and recovery. The submission document can be accessed here. Economic security is a key determinant of mental health and well-being. An adequate standard of living is a critical necessity to support the recovery of a person experiencing mental health or substance use-related illness. “There is a complex two-way relationship between both mental health and substance use and poverty” says Kendra Milne, Senior Director of Policy, Planning & Government Relations at CMHA BC Division. The relationship between poverty, mental health and substance use is even more complex for people who experience additional forms of social exclusion or marginalization. For example, Indigenous people grappling with the impacts of inter-generational trauma and the ongoing consequences of colonization face disproportionate rates of poverty, mental illness and problematic substance use; the impacts of stigma, discrimination, cultural interference and poverty are deeply intertwined. 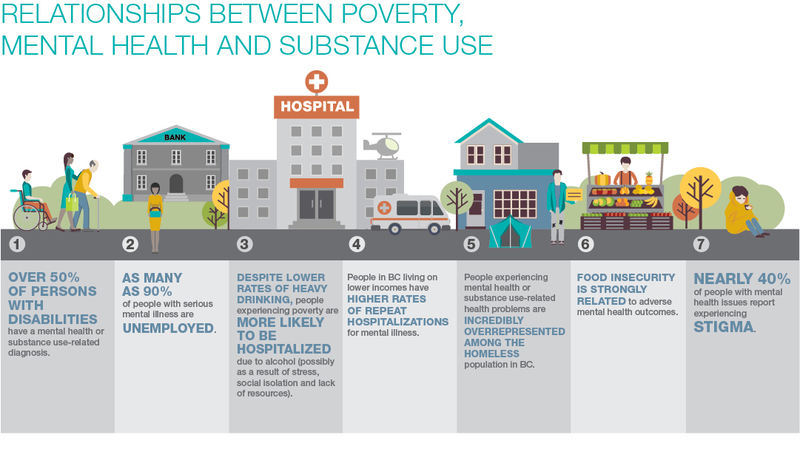 As BC develops its poverty reduction strategy, CMHA BC will continue to advocate for solutions that support mental health, wellbeing and recovery. Over 50% of people designated as a “persons with disabilities” under the Employment and Assistance for Persons with Disabilities Act have a mental health or substance use-related diagnosis. [i] Many more are likely relying on regular income assistance. Celebrating our 100th anniversary in 2018, CMHA is Canada’s most established mental health charity and the nation-wide leader and champion for mental health. CMHA helps people access the resources they need to maintain and improve mental health, build resilience, and support recovery from mental illness. Each year in BC alone, CMHA serves more than 100,000 people all across the province. For mental health and addiction information and resources visit www.cmha.bc.ca. [i] Data provided by the Ministry of Social Development and Poverty Reduction to the Supporting Increased Participation table. [ii] Standing Committee on Human Resources, Skills and Social Development and the Status of Persons with Disabilities, Breaking the Cycle: A Study on Poverty Reduction (May 2017). Examining Hospitalizations Entirely Caused by Alcohol and Strategies to Reduce Alcohol Harm (2017). [iv] Canadian Institute for Health Information, “Health Indicators Interactive Tool”, online: https://yourhealthsystem.cihi.ca/epub/ (searched using most recent year available, by province, for “30-day Readmission for Mental Illness”, “Mental Illness Hospitalization – T”, “Mental Illness Patient Days – T”, and “Patients with Repeat Hospitalizations for Mental Illness”). [v] BC Non-Profit Housing Association and M. Thomson Consulting, 2017 Homeless Count in Metro Vancouver; Jessica Hannon, Dying on the Streets: Homeless Deaths in British Columbia, 2006-2015 (3rd Edition, 2017). [vi] Greg Richmond, “Housing Our Homeless” Visions: BC’s Mental Health and Addiction Journal 12:3 (2017). [vii] PROOF Food Insecurity Policy Research, “Fact Sheet: Food Insecurity and Mental Health” online: http://proof.utoronto.ca/resources/fact-sheets/#mentalhealth. [viii] Jamie Livingston, Mental Illness-Related Structural Stigma: The Downward Spiral of Systemic Exclusion Final Report (Mental Health Commission of Canada, 2015). [ix] Jamie Livingston et al, “The effectiveness of interventions for reducing stigma related to substance use disorders: a systematic review” Addiction 107:1 (2012).